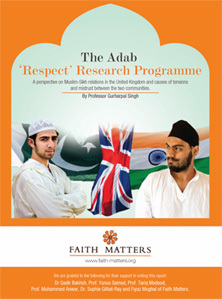 The Adab (Respect) research report builds on the work that Faith Matters undertook in Corrymeela in 2008 where a group of Sikhs and Muslims took part in facilitated discussions sessions looking at issues affecting both communities in England. That report (the Cohesive Communities report) is listed on this site. This report is the first detailed study of its kind into this area and we hope that you find the resource useful.